The days grow a little shorter. The winds blow a little cooler. Autumn is in the air. This is my favourite time of year, when I happily pull out of storage my much-loved sweater – a bulky, cozy fisherman-knit pullover made by my mom – tweed cap and driving gloves, pop the roof down in my 1972 cherry red Triumph TR6, and go for one last, very brisk drive in the country before the end of the season. A change of season is also my excuse to head off to the garden centre for seasonal flowers to fill my containers and beds. For fall decorating I choose grasses, kale, gourds and chrysanthemums. Because the chrysanthemum is such a popular flower choice for fall decorating, it seemed a fitting option for this blog, posted on these first days of autumn. Until recently I didn’t have much regard for chrysanthemums (or mums). I saw them as a cheap, boring, mainstream, unimaginative flower available everywhere and anywhere – corner stores, supermarkets, florist shops, street vendors. Then I took a workshop with the talented Scandinavian floral artist, Per Benjamin, who taught us how to make incredible, original floral designs using the cheapest, least respected flowers, namely chrysanthemums and carnations. He shared with us an experience he had with one of his clients, a 5 star hotelier, who requested that absolutely no chrysanthemums be used for his hotel. Per did just the opposite and designed the most beautiful arrangements using only this flower. His client was pleasantly surprised and has since been using chrysanthemums almost exclusively. I now enjoy creating with chrysanthemum. I can choose from a wide range of shapes and colours, and am limited only by my imagination in how I arrange them. Their inexpensive price point is an added bonus. 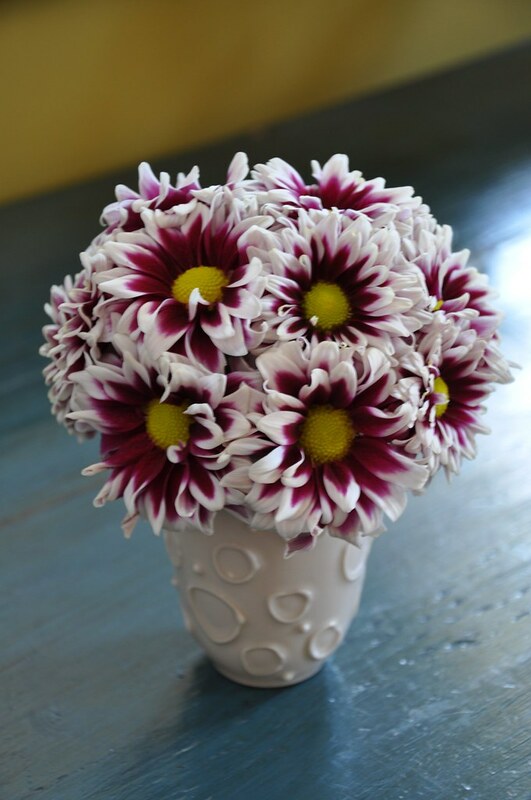 Chrysanthemums symbolize optimism and joy and cheerfulness. Originating in China where it was considered an herb, and used primarily for medicinal and meditative purposes, this flower was believed to have the power of life. In the 8th century AD, the chrysanthemum was brought to Japan where it has been revered for centuries. The Japanese considered the orderly unfolding of the chrysanthemum’s petals to represent perfection and that a single petal placed at the bottom of a wine glass would encourage a long, healthy life (http://www.mums.org/journal/articles/chrysanthemum_history.htm). It became the crest and official seal of the Emperor of Japan and was also used in the family seals of prominent Japanese families. The Imperial Order of the Chrysanthemum is the highest order of chivalry. Japan still celebrates this flower as a symbol of honour and royalty during the Festival of Happiness. All cultivars of chrysanthemum, of which there are 100’s, belong to the Compositae or Daisy family. The name has Greek origins; the Greek prefix “chrys” means golden and “anthemion” means flower. The original colour of chrysanthemum was golden and the earliest illustrations of mums shows them as small, gold daisy-like flowers. Since being introduced into the western world during the 17th century, the chrysanthemum has been hybridized beyond a simple daisy shape. 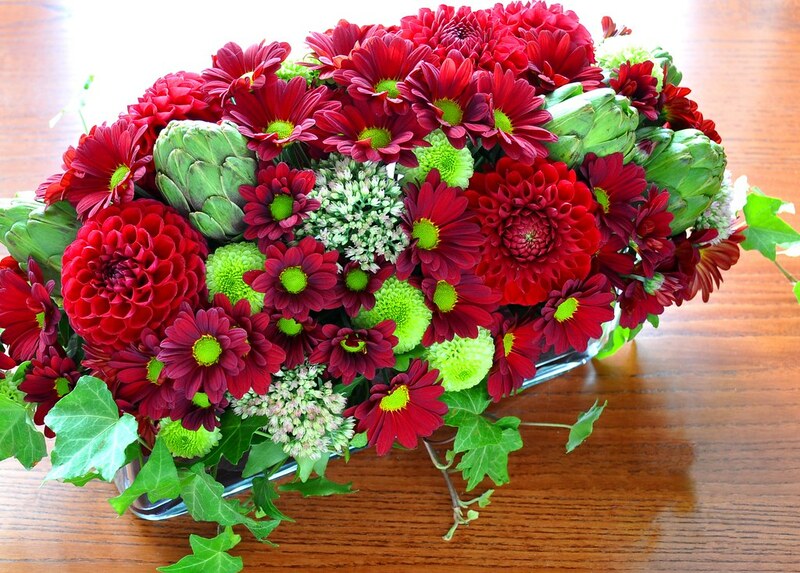 Varieties include pompom, spider, football, button and daisy mums in a huge range of colours and colour combinations. I have used the classic European hand-tied method to give the posy a perfect domed shape for this arrangement (above image). This method of floral arrangement takes some practice to get the shape perfect. Because there is only one variety of mum used it is essential to find one that is truly unique in colour or shape. Also, the vase should be unusual in some way. Chosen well, these design elements will make the difference between an everyday arrangement and an eye-popping, conversation piece. 1 – 2 bunches chrysanthemums – single variety. Starting with the longest straightest stem, position other stems to the left with the stem ends pointing towards the left. Rotating counter clockwise continue positioning until desired fullness has been achieved. Tie off with elastic or rope. Trim stems so that the flower heads sit just on top of the vase lip. The number of flowers you use depends on the size of the vase opening. Wider opening equals more stems equals more show. Fill vase half way with water that has been treated with floral food. Enjoy! This arrangement will last up to 2 weeks. This entry was posted in Floral Arrangement, Floral Design, September and tagged Celosia, chrysanthemum, fall flowers, Floral Arrangement, floral artist, floral design, florist shops, Mums, seasonal flowers. Bookmark the permalink. Both comments and trackbacks are currently closed.